← Tell me a story! Got any family stories? Today’s BlogHer Find Your Roots prompt is about family traditions. Of course we in the States have our standard holidays with their traditions, with some variation by family. The only special cultural tradition I’ve kept from my childhood has to do with New Year Good Luck Foods. There are no other Dutch traditions I know of. My Japanese side has a LOT of cultural traditions. I think the Japanese have the most holidays and celebrations of any country, but they don’t get celebrated much by Japanese in the States. I don’t know anyone here who throws roasted soybeans out the door in February for Setsubun, shouting, “Oni wa soto! Fuku wa uchi!” That means, “Demons get out! Happiness come in!” Japanese have a thing for cleaning the house of dirt and bad spirits each year and starting fresh. I do clean the house extra well just prior to New Year’s Day, like the spring cleaning tradition in the U.S. which I suspect most people don’t follow anymore. I don’t know if my Japanese friends do this New Year cleaning anymore either, but I just can’t stop myself. Mom taught me well. I’m fortunate to live in St. Louis where we have the annual Japanese Festival on Labor Day weekend at the Missouri Botanical Garden. MoBot has the biggest and arguably the most lovely Japanese garden in the country, and the biggest Japanese Festival. That’s when everyone becomes part Japanese. People of all races are seen wearing yukata, the cotton summer kimono which are sold by a vendor there. We dance around the yagura, a raised stage holding a singer/leader and taiko drummers. This folk dancing is done as part of the annual Obon festival, where in Japan the people welcome back the spirits of deceased ancestors for a few days. There is so much going on at our St. Louis festival, like a crash course in all things Japanese. My mother dearly loved it because it made her feel she was back in Japan. You can see my video of the St. Louis Japanese Festival on YouTube. Especially now that my mother is gone, I have to keep up the tradition of bon dancing, or bon odori. Tsukiga … deta deta …. 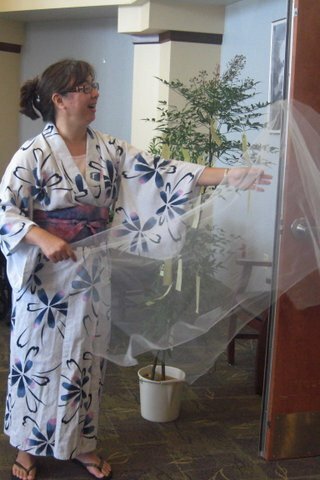 This entry was posted in heritage, traditions and tagged culture and heritage, holiday traditions, Japanese Festival. Bookmark the permalink.